Another day at Yekatit 12 for cleft palate training. We had another wonderful class/lecture in the morning featuring interactive role-playing between TC students and the rest of the class. The TC students role-played as patients while the other students acted as clinicians. Each “patient” was assigned specific cleft palate speech characteristics, and was instructed how to respond to treatment. This exercise proved extremely helpful, and we all felt more confident and competent when working with our patients later that afternoon. 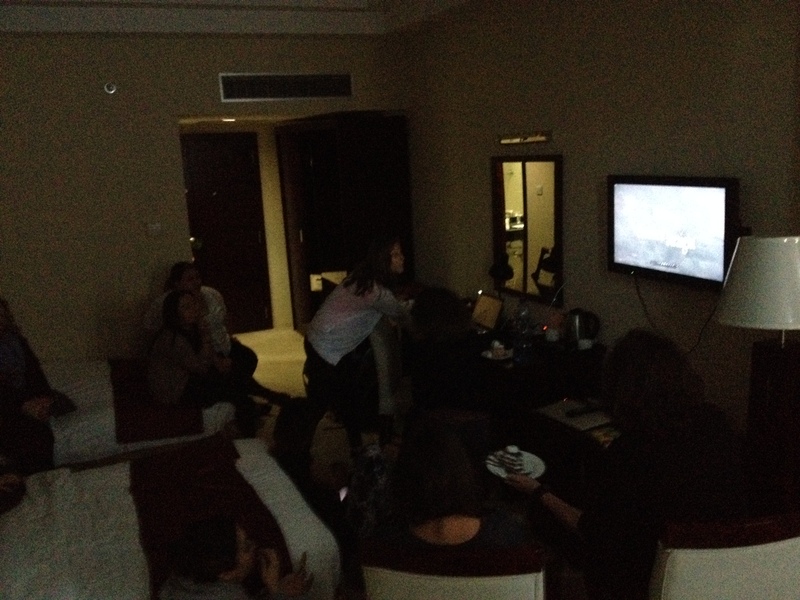 When we got back to the hotel, we met (along with cake and cookies) to watch the movie “Making the Crooked Straight,” a documentary that follows Dr. Rick Hodes, a man who provides medical care all over Ethiopia. He provides free medication and raises surgery funds for patients with tuberculosis of the spine and other illnesses (or arranges for them to have surgeries in other countries). Dr. Hodes and his work is truly inspiring, and if all goes as planned, we may be meeting him for dinner on Wednesday! Finally, we ended the evening with a birthday celebration for our fantastic filmmaker/photographer Josh Hayes (happy birthday, Josh!). It was a nice way to close a full day of training, clinical work, and cultural enrichment. Surgery day was by far one of my favorite days in Colombia so I can relate to your excitement of participating in the surgical experience! Seeing live the structures we learn about in class is incredible, as you mentioned! Good for the surgeon who gave you all detailed explanations of the steps he was taking–that means a lot!! Love the pic, Michael!! Funny, I did not even recognize Michael! You look very official. Just amazing experiences. Michael, love that picture of you in scrubs! Super intense! 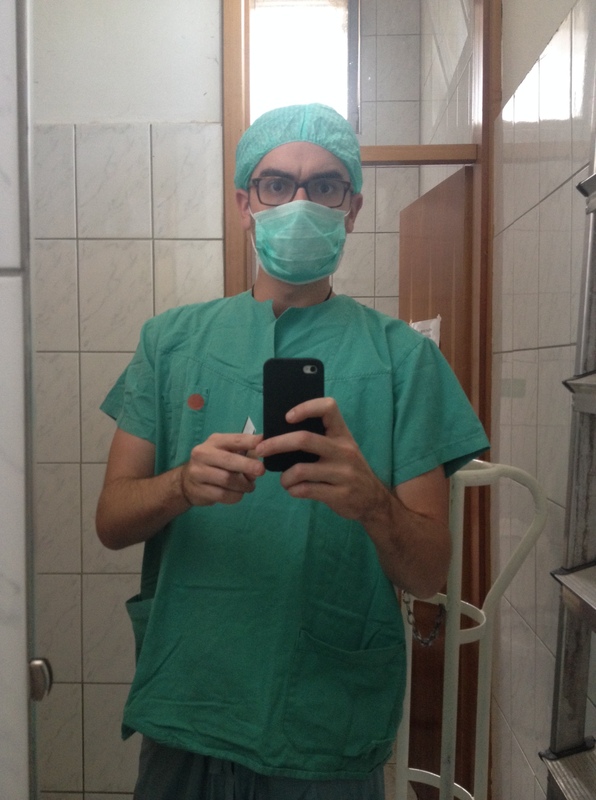 What a unique experience – not only being in an operating room – but observing such a unique case! How nice of the surgeon to walk you all through the steps of the surgery! Hope you all get an opportunity to meet Dr. Hodes! Very inspiring! Happy Birthday, Josh! Looking forward to seeing your footage and photographs! And I agree with Bernadine’s comment above! You’re all definitely missed here at TC! Yay, seems like you all learned so much and made such nice contributions. We miss you here at TC, but what a meaningful experience for all of you. Can’t wait to hear about everything! Sounds like another super productive day! Wish I could be there. Can’t wait to see the pics, watch all the videos, and hear all the stories.